Beneath the City of Lights lies another world; a network of old caves, quarries, and tunnels that stretch hundreds of miles. Paris is a magical city filled with history, art, architecture, and romance. Tourists and locals alike spend their time walking down rain-drenched cobblestone streets and dining in dimly lit cafes. But beneath the City of Lights lies another world; a network of old caves, quarries, and tunnels that stretch hundreds of miles. They are known as the Paris Catacombs, and they’ve been a part of Paris since the late 18th century. What are the Paris Catacombs? The Catacombs are underground ossuaries in Paris that hold the remains of more than six million people. As an effort to eliminate the city’s overflowing cemeteries, the catacombs were created in 1774 after a series of cemetery basement wall collapses. In their early years, the Catacombs were a disorganized, unsightly bone repository. Recent renovations have since transformed the underground caverns into a visitable monument. The Catacombs are largely to thank for Paris’ skyline, which lacks the skyscrapers typically found in major cities. The Catacombs are located directly under the city streets, so large architectural foundations cannot be maintained. In the 1800s, the Catacombs were used by farmers to cultivated true champignon de Paris or button mushrooms. Over 2,000 tons of mushrooms were harvested every year. Every November 3rd, the ghost of Philibert Aspairt is said to haunt the tunnels late at night. Aspairt died in the Catacombs after entering them via a staircase located in a nearby courtyard and wasn’t discovered until 11 years later. His tomb is in the restricted part of the Paris Catacombs, under the rue Henri Barbusse. 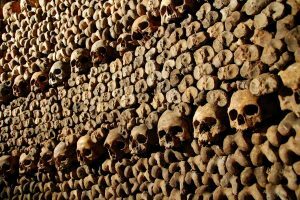 The Catacombs have become host to secret, underground parties thrown by “Cataphiles.” The most recent concert held in the ossuaries, however, was recorded in 1817. This entry was posted on Wednesday, October 4th, 2017	at 3:47 pm	. You can follow any responses to this entry through the RSS 2.0	feed. Both comments and pings are currently closed.